Do you recycle? Recycling is a great way to help save the environment. We recycle in our household and our town makes it easy by offering bi-monthly curbside pick-up. However I’m always looking for ways to make things as easy as possible. 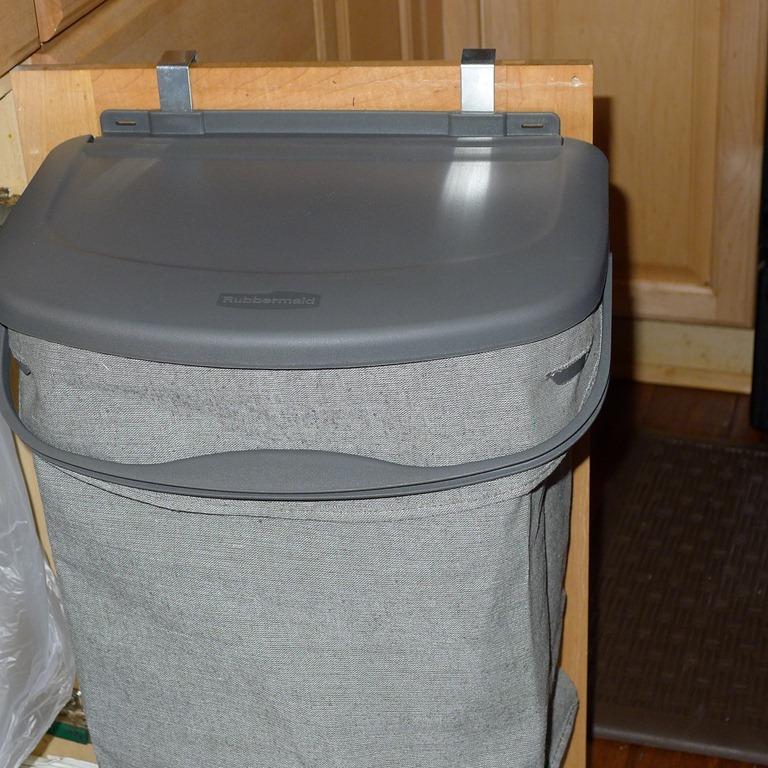 So when Rubbermaid offered me the chance to review their latest recycling offering I jumped at the chance. The new Rubbermaid Hidden Recycler is designed to make recycling quick and easy. Before I received the Rubbermaid Hidden Recycler, we would just sit our bottles, cans and other recyclables on the kitchen counter and would eventually make their way down to our garage where we keep our recycling bins. As you can imagine, our counter top would become pretty cluttered. That has now changed. 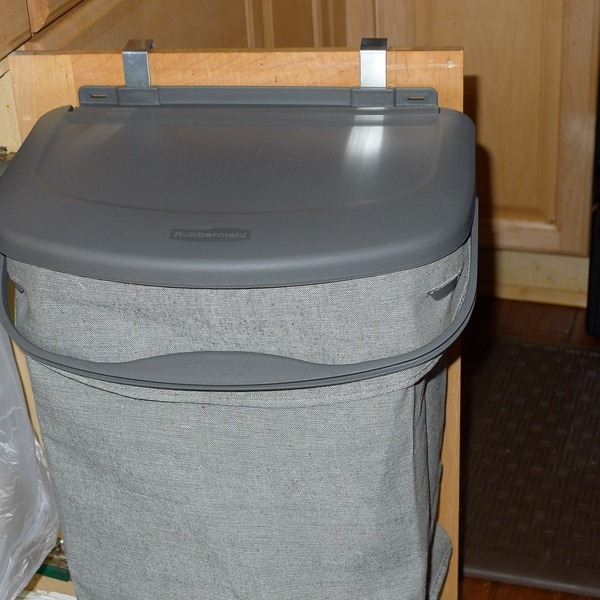 The Rubbermaid Hidden Recycler is basically a 5 gallon bag that attaches to the inside of a cabinet door. I attached mine to the cabinet door under my kitchen sink. Installation was super easy, and required no tools. It took like 2 minutes to set it up and no tools were required. The recycler bag can hold up to 36 12-ounce cans and can even hold a few gallon milk jugs! Taking out the recyclables is really easy because the bag is portable. Simply grab the handle, slide it off the holder and voila! You can now toss your recyclables into your recycle bin. The bag seems very durable. The inside of the bag is lined and is therefore waterproof. I also like the fact that it is machine washable and it is made of recycles materials so the bag itself can be recycled. I really like the concept of the Rubbermaid Hidden Recycler. Heck, I love just about anything that makes my life easier and more organized. To learn more about the Rubbermaid Hidden Recycler please be sure to visit Rubbermaid.com. Also, please be sure to check out Rubbermaid on on Facebook and Twitter, too. Disclosure: I was provided a product in exchange for this review, however, all thoughts and opinions are 100% mine. I always recycle – It’s just the right thing to do. YES…YES.. YES. I recycle because I care about not wasting valuable natural resources. I recycle. Not just for the planet but also because it provides extra cash. We recycle because it’s just the right thing to do. We do recycle- makes me feel good! Thanks for the giveaway! I don’t recycle. womp womp… I would like to though. I was filling bags with water bottles for a while but not taking them to be recycled frequently. Thanks for the reminder that I need to try again. We are big recyclers. Our neighborhood offers recycling pickup on Fridays, which is great. I love this giveaway, thank you! Yes, we recycle. It’s an easy way to keep the earth clean. we recycle everything. saves trash and helps the earth. Yes we recycle. I think every place that I’ve moved to, even when I was staying at home, there was always a recycle bin. I’m used to doing it and there isn’t a second thought if I need to or not. We love our Recylcer! It really does make it easy! Sometimes, but this would make it so much easier to do it all the time! We recycle what we can. Mostly our soda cans and the like. Not very many recycling plants close, though. I recycle as much as I can. There are 2 Recycling centers near me and I go turn things in and save the money for rainy days! First of all, THANK U for this giveaway!!!!! AWESOME!!! I would SOOOOOOOOOOOOO love to have this in my home!!!! YES!!! I do recycle because it’s all I can give my kids to last a lifetime because after all of us are gone & our next generation is left here to run this world, I want to at least leave it to where it’s not going to take everything for them to live nicely & cleaner!!!! It’s a very important thing we all should think about. I don’t want my kids living in a run down planet & become sick from our lack of responsibility!!! Yes we recycle. We can only put out one bag of garbage so we have no choice but to recycle. Not as much as I used too, now living in an apartment and they don’t have the facilities to recycle like I could when I lived at the house. We recycle as much as possible and also compost. Its free to recycle and you have to pay where we live if you have more that one garbage bag/week… not to mention I love the planet! So why not?!! I recycle as much as possible! We should all help out Mother Nature! we do because it’s easy and good for the earth! We love recycling but I wish the city made it easier and would give us one of those buckets! We don’t have a bucket either. Apparently the people who lived here before us took it with them, and we were placed on a waiting list for a new one form the city. Umm, it’s been 7 years now and we still haven’t gotten one! We do recycle! Our apartment complex has big trash bins for recycling so I separate our plastics, cardboard, etc. Love the convenience (though it sure would be awesome to have this new hidden recycler rather than my plastic grocery bags to hold our recyclables) 🙂 Thanks for a great giveaway! We loved our Recycler! It is so easy to use and I love that it keeps all of the junk off my counter! We always recycle our cans but havent gotten into it all full speed yet. This is awesome! I would love to be able to use this to recycle. I hate wasting, when I can take my recyclables to my kids school and put them in the correct bins. Love it.